Who comes to your mind when you are asked to think about post-colonial British authors? Close your eyes for a few seconds; think hard; then open your eyes and tell me what you came up with. Hmh, let me think …. Kazuo Ishiguro! Does the name ring a bell? Yes? Excellent! I think it’s time to talk about one of Britain’s most eminent writers. He has won the Booker Prize for The Remains of Day in 1989. Even though his last publication was some time ago, in 2009 to be exact, this does not mean that it’s too late to talk about Nocturnes: Five Stories of Music and Nightfall. 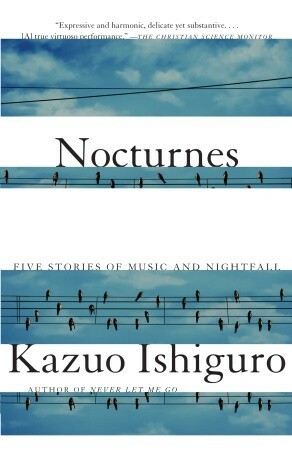 Nocturnes is Ishiguro’s first collection of short stories and consists of five parts: “Crooner”, “Come Rain or Come Shine”, “Malvern Hills”, “Nocturne” and “Cellist”. What bind the stories together are recurring themes and characters which are all tightly connected with music, musicians and music lovers. They are all written in prose style and every story has its own delightful and charming twist. Basically, Nocturnes tells the story of people who have not yet fulfilled their dreams, about people who live ordinary lives and about the sacrifices they have to make every day. We all have a vision of who we are, but very often the world does not allow us to fulfill your dreams. All the characters in Nocturnes struggle with their lives; some get it right, some get it wrong, but they all have to overcome obstacles. I guess this is what makes the book so attractive to us normal ones. It shows that fictional characters are not superheroes after all. When I got hold of Nocturnes, I expected to really love this collection and I have to admit that I found it wonderful in parts. It would be a lie to claim that Nocturnes is absolutely superb, because there are a few flaws in the novel. But all in all, it’s a nice and entertaining read for everyone who likes humorous, cynical and serious stories.